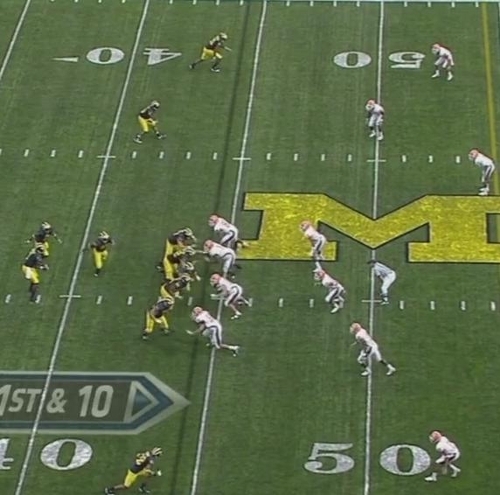 Michigan is in a three wide set with Vincent Smith lined up next to Gardner in the backfield and Kevin Koger lined up as an H-back. 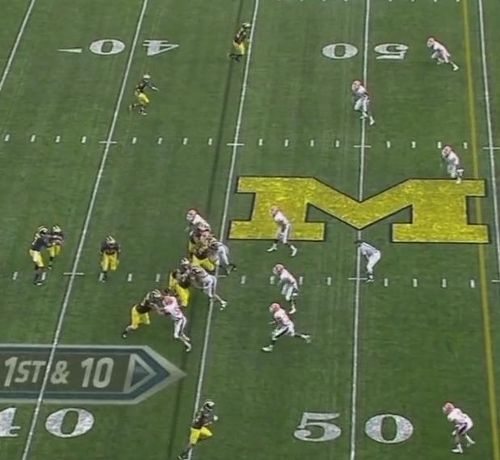 This is the triple option read that Michigan runs a lot: a basic zone read play but if Gardner decides to keep the ball, he also has the option to throw a bubble screen to the slot receiver. 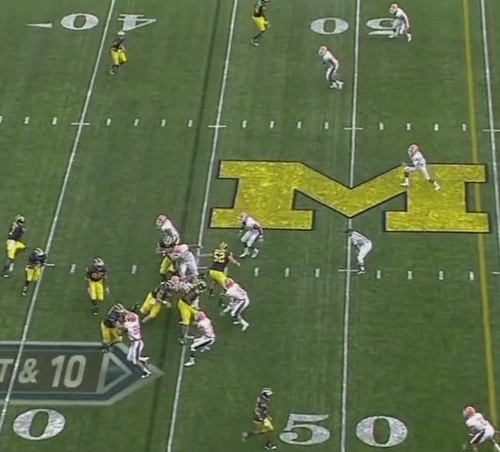 Right off of the snap, you can see that the weakside defensive end is being unblocked. This is the player Gardner needs to read. Remember, if he stays high, Gardner's job is to hand the ball off to Vincent Smith. If the defensive end crashes down on the hand off, Smith needs to pull the ball. 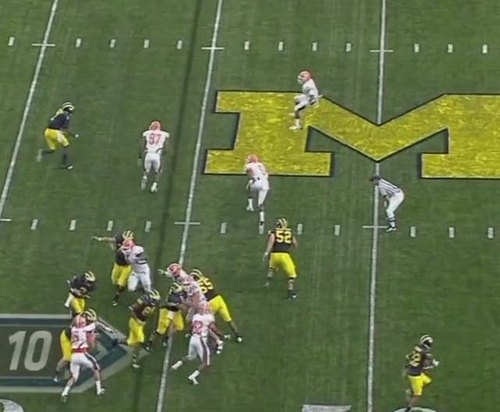 Despite having great blocking for Smith, Gardner decides to pull the ball out and is staring down two defenders. At this point, he still has the bubble screen open, but not by as much. Instead, Gardner, with no blocking ahead of him, tries to juke through two defenders as well as the free safety coming down from his position. This is how the play ends. As you can see, Bowling Green has Gardner boxed in. He won't be able to bounce it outside and he has two defenders on the inside as well. The most disappointing part of this play is that, as you can see at the bottom of the screen, Smith has a cannon shot through the offensive line with Koger about to block off the final defender. Until Gardner can consistently make the correct read here, he won't surpass Forcier who appeared to make the right decision each time he took a snap against Bowling Green. I questioned Gardner's viability as a running threat, which I think was warranted, but part of the problem may also be that he's putting himself in really difficult positions like the one above. 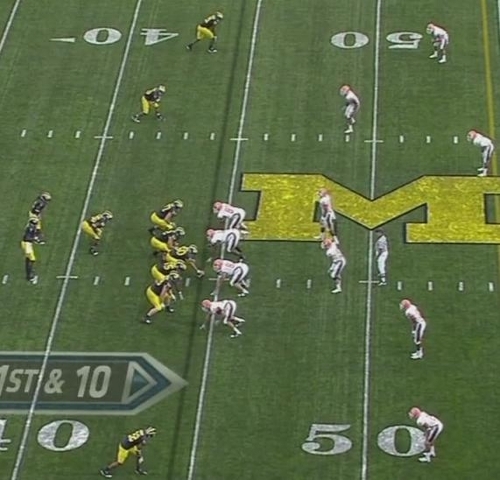 It looks like most teams are preparing to force Michigan quarterbacks to hand the ball off because of Denard. As such, making the proper read and handing the ball off when it's this obvious is a must.